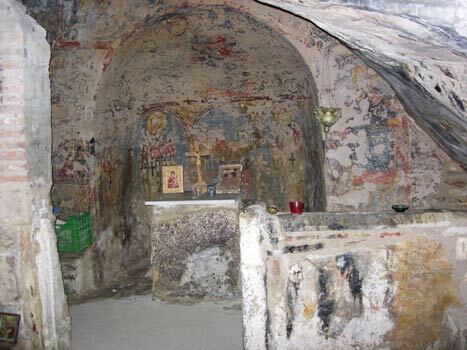 The (Nidrea) of Saint Spyridon and Saint Nicholas are located at the entrance of the ancient quarries in Pendeli. In 1836 the area is shown in an engraving of the traveller Ludvik Lange. The building of this (Nidrea) consists of two separate chapels. 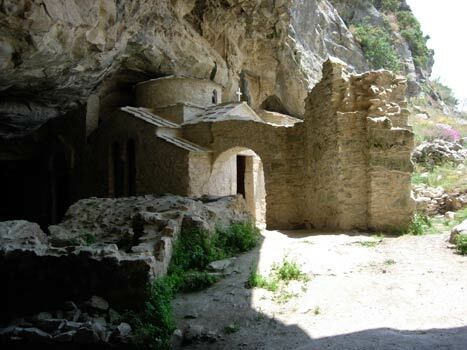 The south side, under the rock and with a non-specific shape is located the chapel of Saint Spyridon which is dated of the 11-12th century. In the North side of the sanctuary carved on the rock, there are shapes of the archangels, eagles, and crosses are distinguishable which probably belong to the previous phase of habitation of the area, probably by hermits. In the south side of the building is located the chapel of Saint Nicholas which belongs to the type of cross-shaped plan-view, covered with a dome. 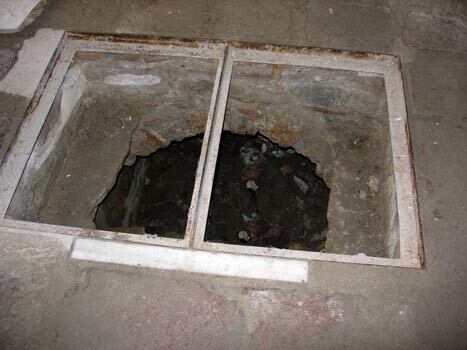 The existence of the two entry doors to the building in this North side shows that the area under the dome had a character of a passage. 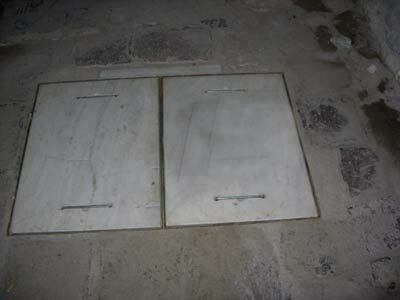 Also the fact that on the floor of the area there are two openings that lead to underground crypts that were probably used as storage for bones (ossuary ) and the positions of graves that are evident in the main Nave bring to the conclusion that the chapel of Saint Nicholas was used from the beginning as a burial chapel. 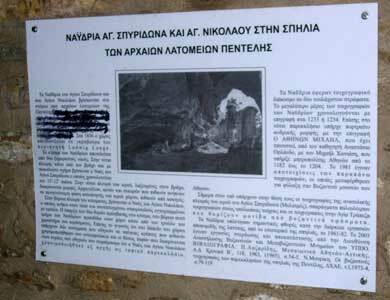 The (Nidrea) had mural decoration of at least two layers. The largest part of the murals is dated with an inscription between 1233 -1234. 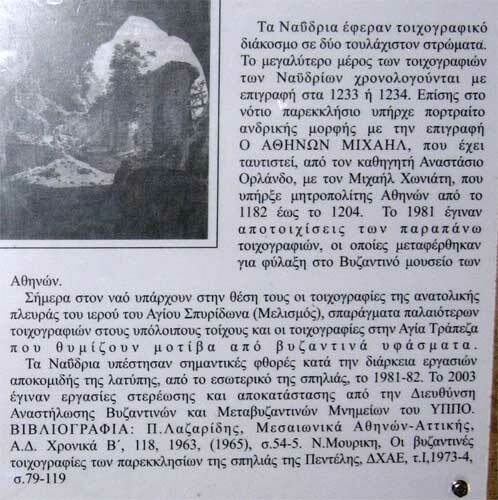 Also in the South chapel there was a male portrait with the inscription "O Athinon Michael" meaning Michael of Athens which has been identified by Prof. Anastasio Orlandthou as Michael Honiates who was Bishop of Athens from 1182 to 1204. 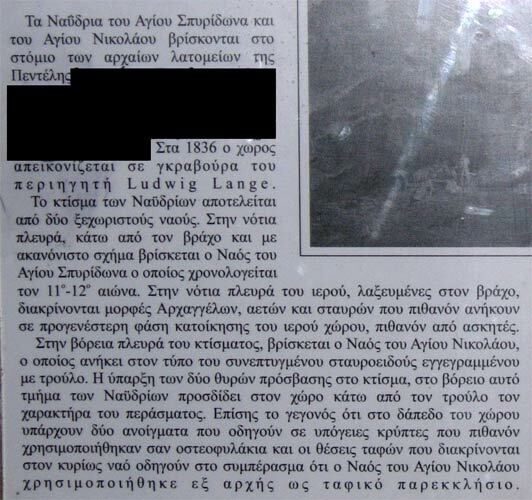 In 1981 the above murals were removed and were transferred for safe keeping to the Byzantine museum of Athens. 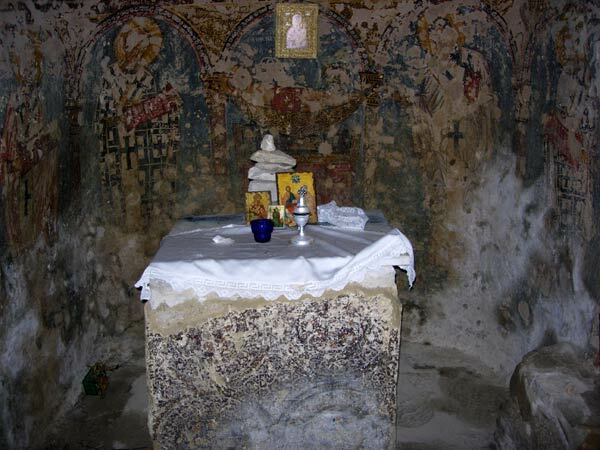 In the chapel today, in the place of the murals there are murals from the Saint Spyridon chapel and pieces of other murals in the Altar which remind one of motives of Byzantine fabrics. 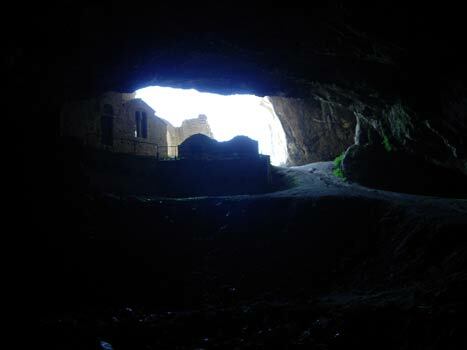 The (Nidrea) sustained considerable damage during works from the removal of (Latipis) (rubble, debris) from the inside of the cave in 1981-82. In 2003 the restoration works were undertaken by the department of Restoration of Byzantine & Post-Byzantine monuments of the Ministry of Culture. In the south chapel a fragmentary fresco of the Virgin and Child spreads across the little apse. The Annunciation is visible on the east wall. The style of the best-preserved frescoes in the north chapel, which was used for burials, is of a cruder, more provincial character.